HERRIN - Fifteen-year-old Alexandra Banks finished her Oreo cookie first and couldn't help but eye the unopened cookie packet on her 7-year-old sister Journey Banks' tray. "Sissy helped me with my apple and drank some of my chocolate milk," Journey Banks said about their Monday noontime meal of hot dogs, carrot sticks, celery, apples and Oreo cookies with milk. The two girls were enjoying the first lunchtime servings of the Summer Food Service Program, "Food that is in when school is out!" served at First United Methodist Church-Herrin and sponsored by the U.S. Department of Agriculture. "I like this program. I like to see kids come in and eat. 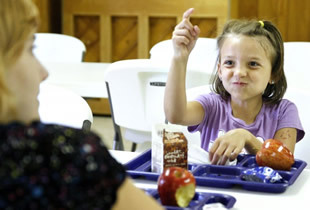 I know they are getting one good meal a day," said Rhonda Broadway, cafeteria manager at Herrin Elementary School. Broadway, along with her sister, Anita Essary, head cook at Northside Primary Center, coordinates the program now in its second year here. Broadway said 38 young people showed up for Monday's lunch that is much more than the eight who showed up the first day in 2009. She's hoping to eventually average about 100 children a day. The program is free to children ages one to 18. Adults can eat for $2.There is no residential requirements. Lunch is served every weekday from 11 a.m. to 12:30 p.m. through July 30. The menus meet all USDA requirements and are identical to what is served at school cafeterias during the school year, Broadway said. First United Methodist-Herrin has loaned use of its basement cafeteria and offered the $8,000 startup money that is eventually reimbursed through the USDA. Broadway said the summer meal program is much needed because most parents are working during the day and don't have time to come home during the noon hour and feed their children.